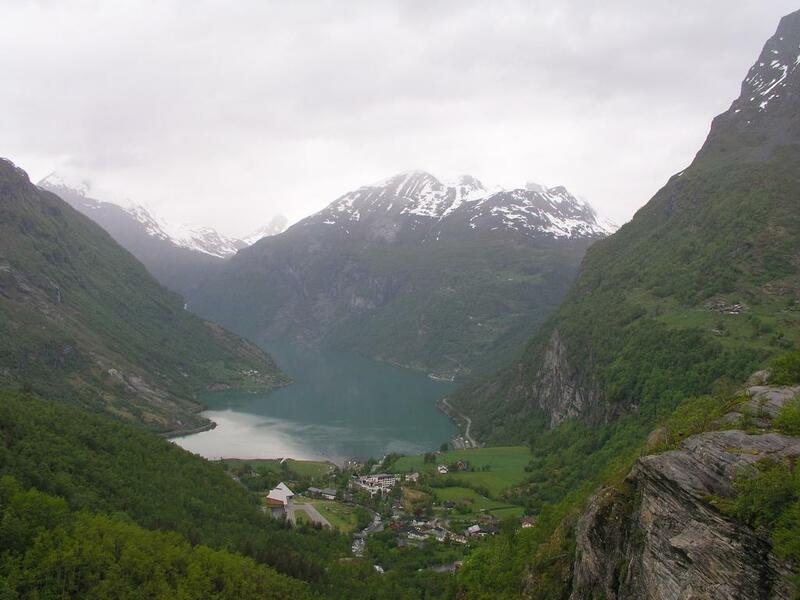 How to get there: This mountain is located west of Ørneveien (The eagle's road) near Geiranger. 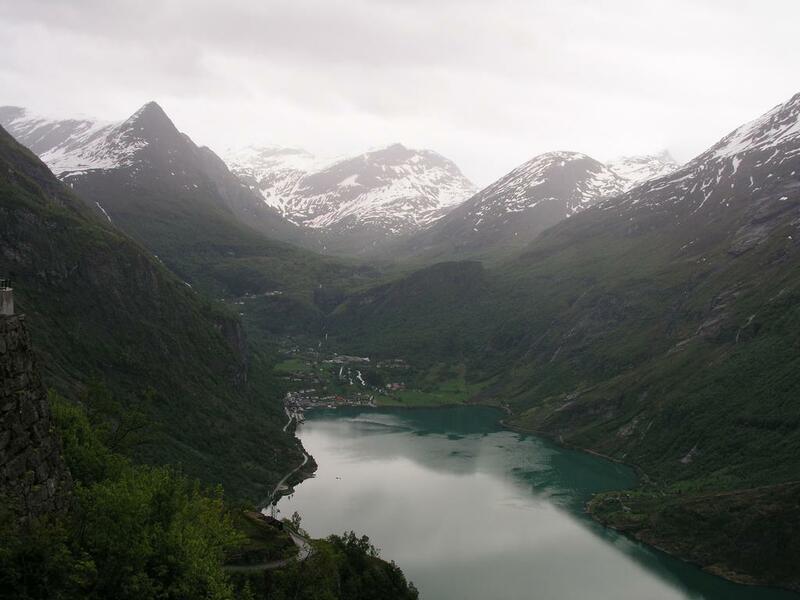 Geiranger may be reached from Oslo (and Trondheim) via Otta or from Bergen via Stryn. The road is closed in winter. The road across Ørneveien is open all year. At the top of the Ørneveien switchbacks there is a good parking area. Route description: Start at the parking, cross the road and go a few meters in the direction of Geiranger. As soon as the main road descends a small road forks of uphill to the right. This road is quite short and leads to the lot of a burnt down cabin. Just before the remains of this cabin, the trail to Haugset sæter continues. Follow this trail to the new and old buildings, a powerline runs more or less the same course. At Haugset, take a look up the mountain. Turvasshornet (1237m) with some minor cliffs are straight up. The more rounded profile of Geitfonnegga (1453m) can be seen further up to the left. Set course for this ridge as you follow open meadows and a small creek in the beginning. Then, staying left of the main ridge, a more level area followed by a natural, but steeper grass gully climbs in the direction of Geitfonnegga. Follow this route to the top of the short gully. Above, the terrain is less steep and easy hiking on a climbing traverse in the direction of Geitfonnegga will get you to the small valley with the creek that drains south from the west side of Turvasshornet. 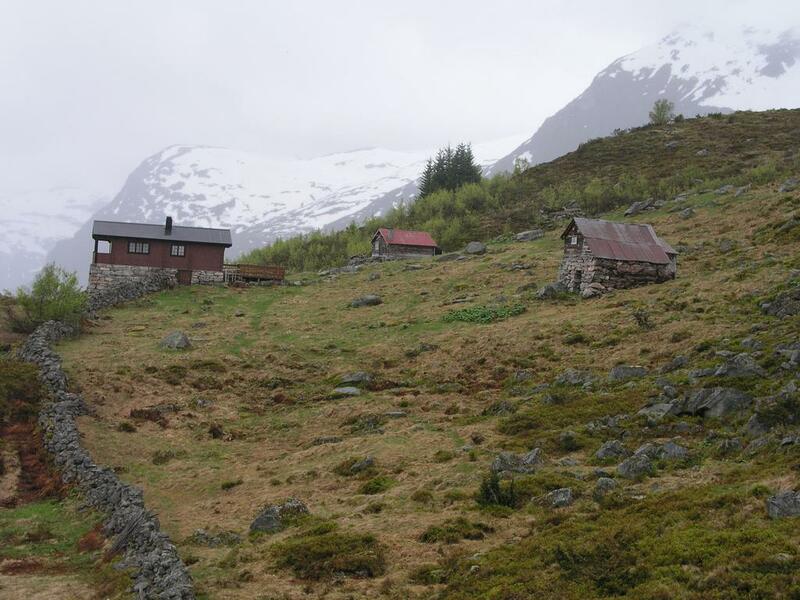 In the spring, a very distinct snow field comes down from Geitfonnegga to this point, when we hiked this snow field was imediately noticed already from the village of Geiranger. Climb this snow, the angle is quite gentle, if the snow is hard then just climb parallel to it along a small ridge. As you reach the top of this snow field you are in a small, but very distinct basin between 1280m and 1300m, see the map. From here, one can climb and follow the ridge on the left which leads directly to Geitfonnegga or follow the ridge to the right which is slightly more direct when going to Eidshornet. The two ridges merge heigher up and the last 100 vertical meters along the main ridge of Eidshornet is a very gentle hike on almost level terrain. The summit ridge is quite broad, but one should be aware of cornices on the steeper east side of the ridge. This hike is (YDS) class 2 in overall difficulty, a nice "off-trail" hike in easy terrain. Comments: I did this hike with my son Pål Jørgen, age 14 and my friend Jan-Frode Myklebust. Start at 1015, summit after 3 hours then slightly more than 2 hours on the return hike. The peak did not have any significant cairn, only a rather small one. 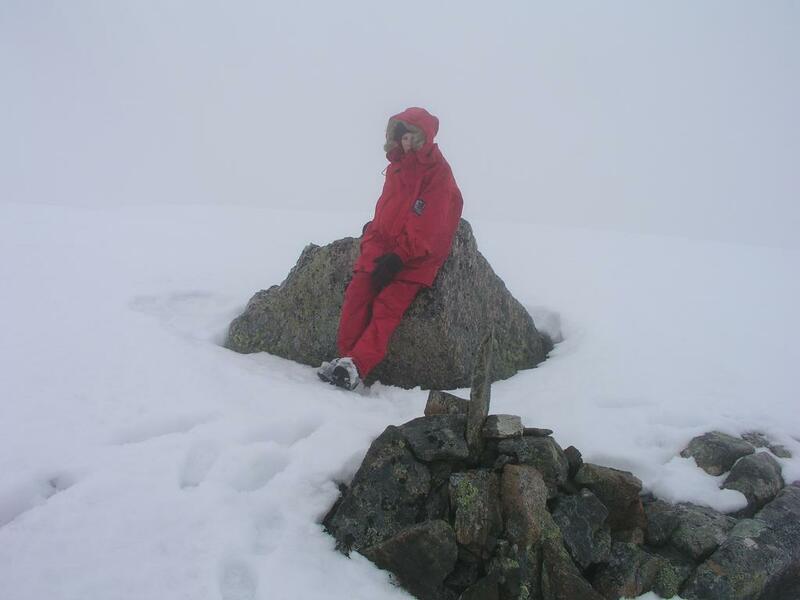 Possibly, there is a cairn below the snow slighly further north. We explored the ridge until it descended and the highest point (on snow) seemed to be a few meters north of the small cairn. We could see the fjord and the surrounding peaks until about 1400 meters, then into the clouds with quite limited visibility. On the return we visited Geitfonnegga (1453m, primary factor 1m), the view of Geirangerfjorden is unique. The descent down along the ridge with the Geiranger village and the fjord directly in view is highly recommended. The saddle defining the primary factor of this mountain is only a couple of meters from the parking area described above. It is quite seldom that a route actually starts directly at the defining saddle. Thus, the vertical gain is exactly 1006 meter. Eidshornet, Geitfonnegga is left, the main summit behind in the middle. The snow gully leading up to the high basin behind Geitfonnegga is clearly visible. Geiranger, as seen from the lower slopes of Eidshornet. 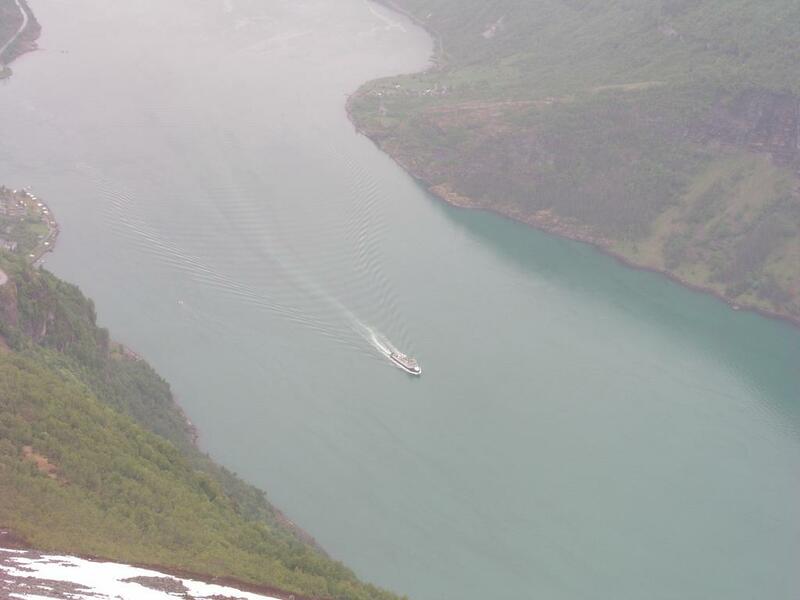 Looking down on he ship, Geirangerfjorden as seen from 1453 meter. 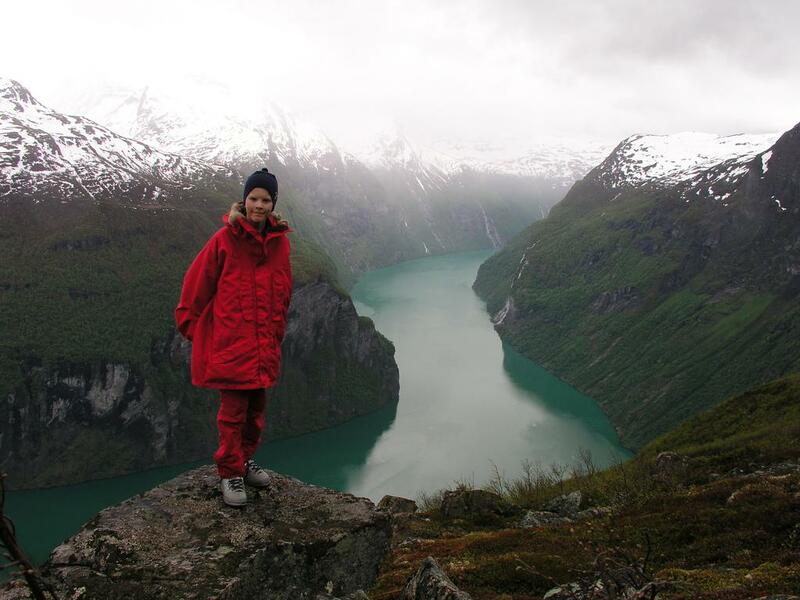 The Geiranger fjord, few fjords are better known. 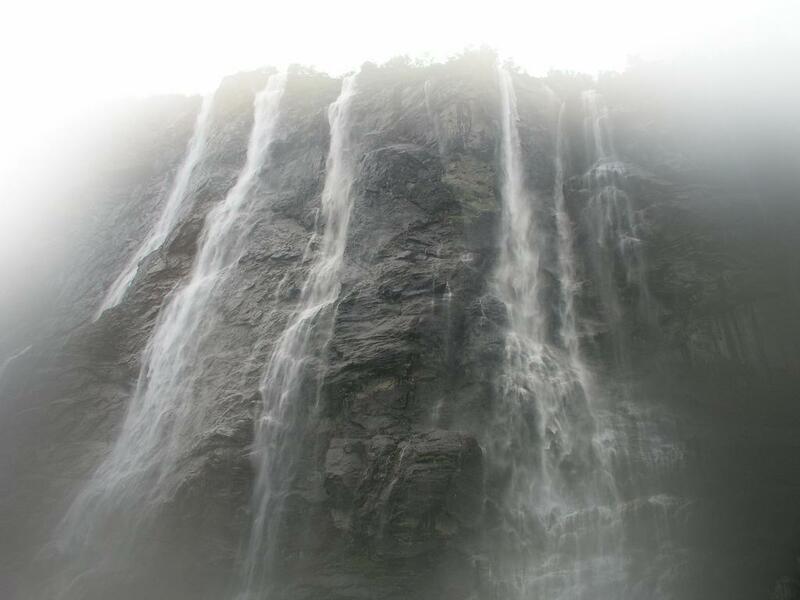 The waterfall named The Seven Sisters can be seen on the right hand side.